This moist garlic roasted chicken is cooked in the slow cooker, for an easy, nearly hands-free meal. A small chicken is best, and it should be started on the high setting, to begin with in order to bring the slow cooker up to temperature. Serve the chicken as a main dish with vegetables or use the cooked chicken meat in sandwiches, salads, casseroles, or soups. Spread half of the garlic in the cavity and spread the rest on the outside of the bird. Place the chicken in the slow cooker and place a few pats of butter on top of the chicken breasts or tuck them under the skin. Sprinkle the chicken, inside and out, with kosher salt, freshly ground black pepper, and paprika. Add the remaining butter and chicken broth to the pot. Cover and cook on high for 1 hour. 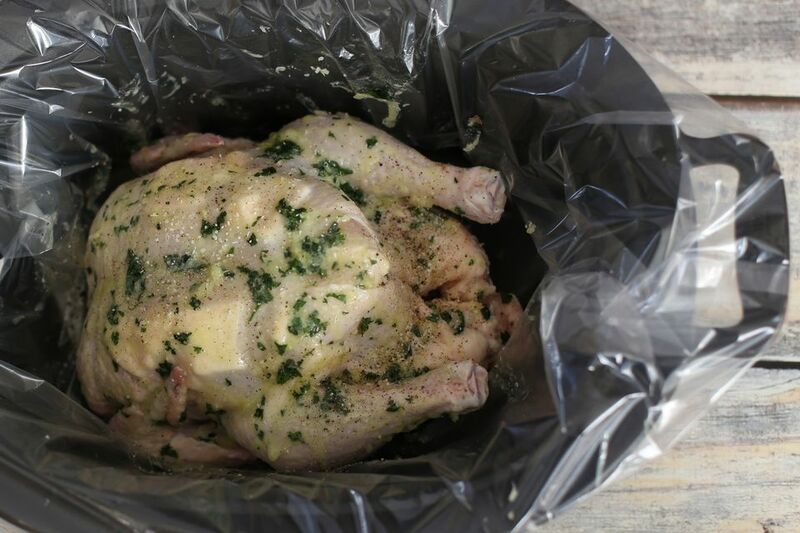 Reduce to low and cook for 5 to 7 hours longer, until tender and juices run clear. Serve the garlic butter sauce with the chicken. If desired, add a quartered onion to the cavity along with unpeeled lemon or orange wedges and sprigs of herbs. Rosemary, parsley sprigs, thyme, sage, or chives are all good choices for aromatic herbs. Substitute a good Creole or Cajun seasoning for the salt, pepper, and paprika. Sprinkle it lightly all over and in the cavity of the bird. Use a cut up chicken in the recipe instead of a whole bird.